Everything that I do always seems to take longer than I expected BUT once I set my mind to something I do make it happen! Plus I’m always amazed by the ‘magnetic’ power of enthusiasm and positivity (two characteristics that people seem to associate with me). After showing my Arts Council supported installation, DeepSpaceMoolog, at 20-21 Visual Arts Centre, North Lincolnshire (Sep-Nov 2016) I knew that I wanted to show it again and I particularly wanted to find a more cavelike venue; the motivation for this being that the original inspiration for DeepSpaceMoolog came from the ancient cave-drawings in the Creswell Crags cave system. Things all came together back in May this year. This happened with the help, support and encouragement of various people; firstly George Wade at ALLDesign pointed me in the direction of Jasmine at the (recently relocated) DoodleBar, Bermondsey, London. Next, the DoodleBar team offered me - one of the earliest showing slots in Testbed1 - in the rear arches of the DoodleBar. In fact, it was such an early slot that at that point there was no mains electricity so I knew from the beginning that I would be reliant on a petrol driven generator (not noisy as it was sited out in the back area). Testbed1 had already hosted events by: RCA Performance Pathway students, The Architectural Association and some band photo/ film shoots so I knew that, with the right lighting, DeepSpaceMoolog could be very atmospheric. The next step was to work out how to suspend my beautiful digitally printed fabric cave ‘wall’ but there were restrictions on attaching anything to the metal clad brick railway arch walls (these rail people are fussy). So my ‘belt and braces’ method involved concrete filled buckets, wooden uprights, canes and cable ties. This method had some plus points including improving my concrete mixing skills (big thanks to Richard Bartle at Bloc Studios for his tips). Thanks to 20-21 for the video screen and speakers and Sparks Theatrical were brilliant at advising on the stage lighting that I required. The logistics of 'operation DeepSpaceMoolog in London'; hanging system, van hire, generator hire and lighting were scary but ...it was an adventure?! In the end, the set-up was easier than I had expected but this was in big part thanks to Dominic Ewan and Dave W’s moral support and very practical technical assistance. Plus a cup of DoodleBar tea to start! Dominic Ewan’s experience in live events and performance lighting was invaluable and it was thanks to his skills and patience that the cave atmosphere was achieved. I really love the shadows that the beings and spacerocks cast as they magnified the drama and otherworldliness of the DeepSpaceMoolog experience and made it much more immersive; exactly what I wanted! 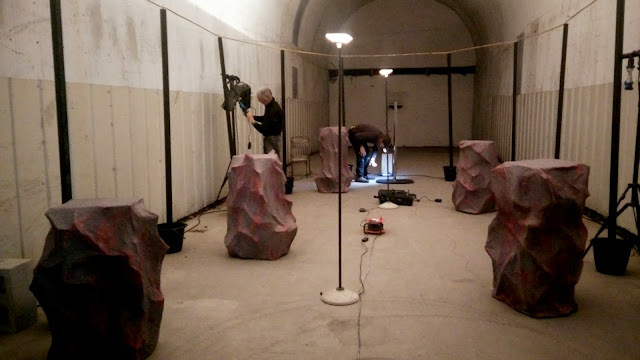 Another aspect of the vaulted space of Testbed1 was that it gave an even more sinister quality the DeepSpaceMoolog video soundtrack as it bounced off the tunnel walls. If only Alan Watts could time travel and come back to hear how I’ve woven his philosophical ponderings into this installation. 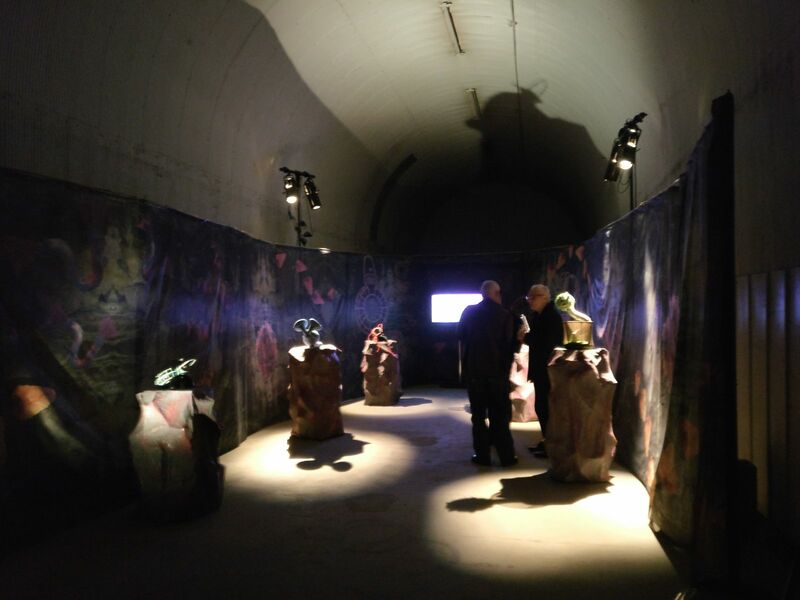 Visitors who arrived during the day; walked through the fairly light entrance, turned the corner into Testbed1 and, although fairly dark, they could still see most of the details on the printed cave backdrop- whereas visitors who came later in the evening had the darker experience. Some visitors even had the emergency power version. I.E. when the generator unexpectedly ran out of fuel and we had to resort to head torches! Interestingly my fellow cave visitors at that time loved it! Having put so much creative energy, time and a big chunk of my life into making the work for DeepSpaceMoolog it was really brilliant to give it another showing and have it seen by even more people. It was wonderful to see Andrew Logan again and I am eternally grateful for his enthusiasm and support. Despite DeepSpaceMoolog originally being inspired by the cave art of Creswell Crags the beings (sculptures) can be appreciated on various levels; you don’t need to be part of the art world to ‘get it’.